From a standpoint of basic human anatomy in western medicine, there are two main portions of our brain that facilitate the balance and imbalance of our emotional state: the limbic system and the frontal lobe. The limbic system is the complex set of brain structures that are responsible for various functions such as: emotion, behavior, motivation, long-term memory, and our sense of smell. The frontal lobe is the area of the brain that is responsible for our ability recognize future consequences resulting from current actions, to choose between good and bad actions (or better and best), override and suppress socially unacceptable responses, and determine similarities and differences between things or events. Together, these two portions of the brain must find an integrated balance for us to be centered emotionally. Times of crisis integrate these regions the fastest, which is why our brains are able to quickly prioritize things that are most important in our lives during fight or flight states. However, integration can also be achieved through things like acupuncture; allowing the two portions to communicate with each other through the fronto-limbic loops in a symmetrical pattern across both halves of the brain (thereby increasing serotonin levels, adrenocorticotrophic hormones, beta-endorphins, and noradrenalin). Unlike the western medical world that attributes emotional and mental processes to the human brain, Chinese medicine believes that the emotions are part of a larger sphere of actions that are connected by all of the internal organs/meridians. Chinese Medicine understands that there is a reciprocal relationship between our emotions and our organs/meridians – a disparity of either one will affect the other. As you glance over the chart below can you find connections between times in your life that imbalanced emotions have can caused physical ailments in your body (i.e. trouble taking deep breaths when experiencing grief or sadness, gastrointestinal issues or diarrhea from excessive worry, a lack of willpower and motivation that eventually turns into adrenal fatigue, etc…)? Through the various modalities of acupuncture, a practitioner can treat a specific organ/meridian and influence its corresponding emotion. Unlike some forms of medicine, acupuncture focuses each treatment on balancing the entire body – both physically and emotionally. The goal of an acupuncture treatment is to help treat the root of a patient’s ailment and to help him/her find a whole body homeostatic balance. Whether it is through acupuncture needles or other Traditional Chinese Medicine tools (ex: herbal formulas, tui na massage, moxibustion, auricular therapy, etc…), an acupuncture treatment may be the missing tool that many of us need to bring that emotional balance back into our lives. The development of modern auriculotherapy (ear acupuncture) has been one of the greatest acupuncture tools that has helped shape the way that practitioners can treat these particular imbalanced emotions. Although auriculotherapy has its historical origins in ancient China, recent discoveries through the work of Dr. Paul Nogier, M.D. of France has grown this treatment modality over the past several decades. Dr. Nogier was fascinated with the ear because this rare organ is comprised of all three embryonic tissues (endodermic, and ectodermic, and mesodermic) and it acts a micro-system to the rest of the body. Through various studies over the years, he helped bridge a gap between Eastern and Western medicine by discovering that the ear had hundreds of specific points that, when stimulated, would cause a reaction in our central nervous system and positively affect corresponding organs, glands, and musculoskeletal systems. 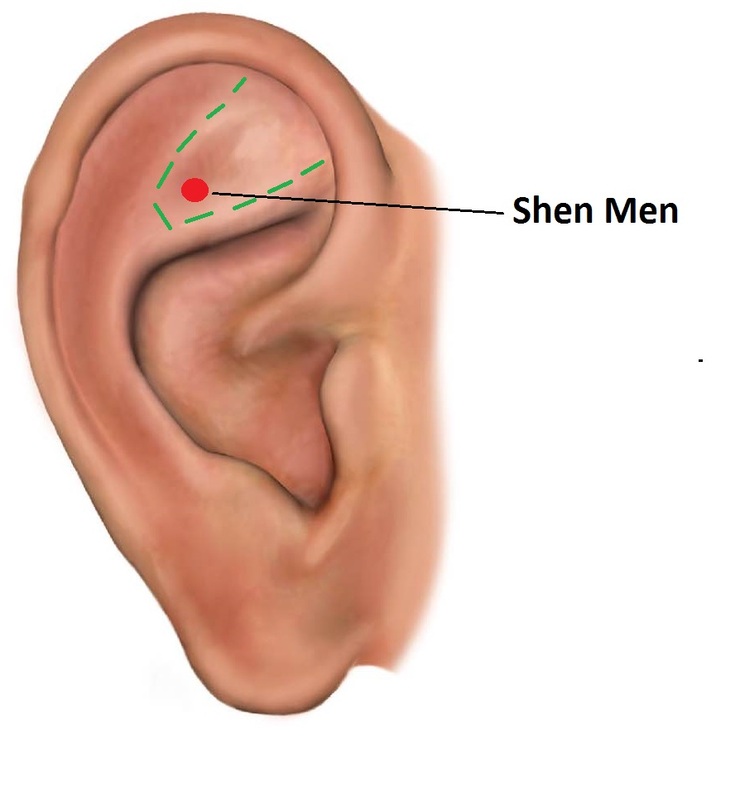 Unlike acupuncture body points that have a specific locus on the body that can always be detected, auricular points on the ear can only be detected (through physical examination or electrical conductivity testing) when there is a problem in the corresponding part of the body that relates to that portion of the ear. While the graph above depicts some examples of auricular points that can be stimulated on the ear by a trained acupuncturist, there is one amazing point that many of us can stimulate ourselves when we get overly stressed throughout the day. Located in the upper portion of our ear is a structure called the triangular fossa (outlined in green in the side graphic). Within the outer 1/3 of that structure is a point called Shen Men, or the “Divine Gate” point (depicted with the red dot). This point helps with a wide range of ailments including: tranquilizing the mind, alleviating stress, easing tension and headaches, reducing physical pain in the entire body, lowering blood pressure, etc… . To stimulate this point, simply reach up and pinch the front and back of this ear point with your index finger and thumb and massage gently 4 to 5 times per day (or as needed). Take a few deep breathes as you stimulate the point and watch to see how it affects you. You may soon find that this miraculous point will be a must-have tool for your daily life. As we explained before, emotions have a profound influence on our personality, who we are, and what we feel. They are a part of everyday life, but they can sometimes become a cause of imbalance in the body when they become excessive and prolonged. Since the body and mind form an integrated inseparable unit, the emotions can not only cause a disharmony, but they can also be caused by it. As we deal with the stresses of life it is important for us to be able to look at any imbalance from various perspectives and with numerous treatment modalities. Through things like Traditional Chinese Medicine and acupuncture, we can help you find a link between your physical health and your emotional health – bringing a homeostatic balance to your life. Oleson, Terry. Auriculotherapy Manual: Chinese and Western Systems of Ear Acupuncture. Los Angeles. Healthcare Alternatives, Inc. 1998.